Let me introduce myself. 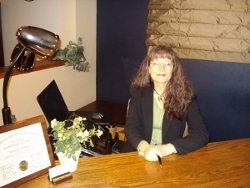 I am Patricia Prichard, founder/owner of THE TAX SHOP for 20 years. Please understand that I am different from most preparers and professionals. I prefer to develop a warm, lasting relationship with my clients. The more I know about you, the more I can help. I have a Bachelor of Science in Accounting. I am a Registered CPA and Enrolled Agent and participate in annual Continuing Professional Education courses to keep me on the leading edge of the ever-changing tax laws. An Enrolled Agent is a person who has earned the privilege of representing taxpayers before the IRS by either passing a three-part comprehensive IRS test covering individual and business tax returns or through experience as a former IRS employee. Enrolled agent status is the highest credential the IRS awards. Individuals who obtain this elite status must adhere to ethical standards and complete 72 hours of continuing education courses every 3 years. Enrolled agents, like attorneys and CPAs, have unlimited practice rights. This means they are unrestricted as to which taxpayers they can represent and what types of tax matters they can handle. Please know that I am not just a data entry operator when I prepare your returns. I ask numerous questions, strive to lower your tax liability within federal and state law when appropriate, and explain the results. I analyze your personal situation and offer suggestions when desired and appropirate. I would appreciate the opportunity to help you with all your tax needs and more. I offer a full range of services at a competivie price. Please call anytime for I am avaiable year round. "Help from Someone who Cares"